This document provides a sample configuration to perform Domain Name System (DNS) doctoring on the ASA 5500-X Series Adaptive Security Appliance (ASA) that uses Object/Auto Network Address Translation (NAT) statements. DNS doctoring allows the security appliance to rewrite DNS A-records. 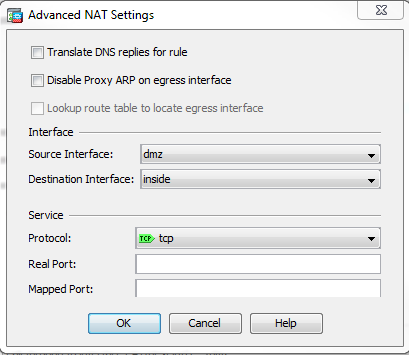 Translates a public address (the routable or mapped address) in a DNS reply to a private address (the real address) when the DNS client is on a private interface. Translates a private address to a public address when the DNS client is on the public interface. Cisco states that DNS inspection must be enabled in order to perform DNS doctoring on the security appliance. DNS inspection is on by default. Translates the DNS record based on the configuration completed with the use of object/auto NAT commands (DNS rewrite). Translation only applies to the A-record in the DNS reply. Therefore reverse lookups, which request the Pointer (PTR) record, are not affected by DNS rewrite. 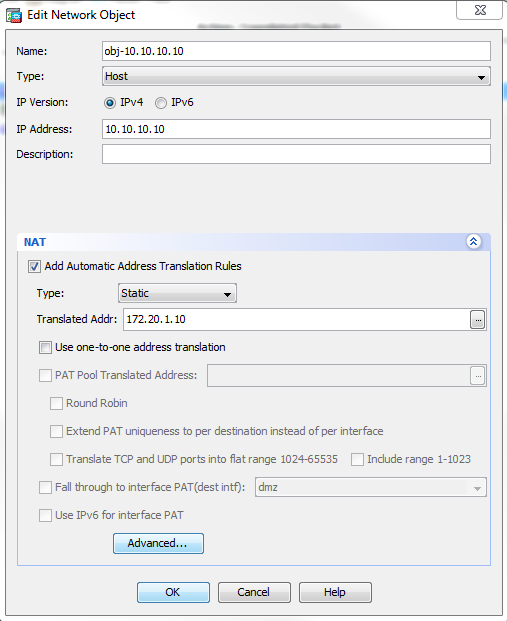 In Version ASA 9.0(1) and later, translation of the DNS PTR record for reverse DNS lookups when using IPv4 NAT, IPv6 NAT, and NAT64 with DNS inspection enabled for the NAT rule. Note: DNS rewrite is not compatible with static Port Address Translation (PAT) because multiple PAT rules are applicable for each A-record, and the PAT rule to use is ambiguous. Enforces the maximum DNS message length (the default is 512 bytes and the maximum length is 65535 bytes). Reassembly is performed as necessary in order to verify that the packet length is less than the maximum length configured. The packet is dropped if it exceeds the maximum length. Note: If you enter the inspect dns command without the maximum length option, DNS packet size is not checked. Enforces a domain-name length of 255 bytes and a label length of 63 bytes. Verifies the integrity of the domain-name referred to by the pointer if compression pointers are encountered in the DNS message. Checks to see if a compression pointer loop exists. The information in this document is based on the ASA 5500-X Series Security Appliance, Version 9.x. This configuration can also be used with the Cisco ASA 5500 Series Security Appliance, Version 8.4 or later. Note: The ASDM configuration is applicable to version 7.x only. In a typical DNS exchange, a client sends a URL or hostname to a DNS server in order to determine the IP address of that host. The DNS server receives the request, looks up the name-to-IP-address mapping for that host, and then provides the A-record with the IP address to the client. While this procedure works well in many situations, problems can occur. These problems can occur when the client and the host that the client tries to reach are both on the same private network behind NAT, but the DNS server used by the client is on another public network. This diagram is an example of this situation. In this case, the client at 192.168.100.2 wants to use the server.example.com URL in order to access the WWW server at 10.10.10.10. DNS services for the client are provided by the external DNS server at 172.22.1.161. Because the DNS server is located on another public network, it does not know the private IP address of the WWW server. Instead, it knows the WWW server mapped address of 172.20.1.10. Thus, the DNS server contains the IP-address-to-name mapping of server.example.com to 172.20.1.10. !--- to the WWW server. The client sends the DNS query. PAT is performed on the DNS query by the ASA and the query is forwarded. 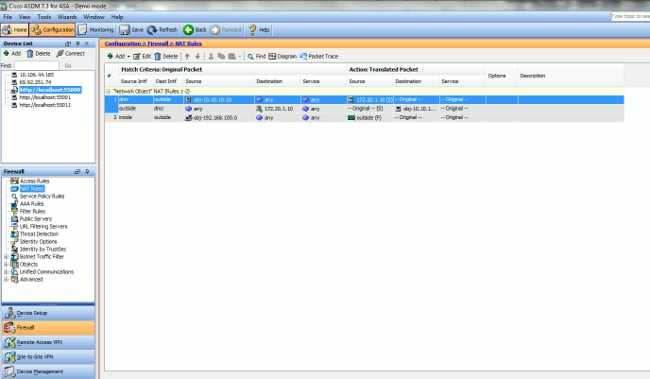 Note that the source address of the packet has changed to the outside interface of the ASA. 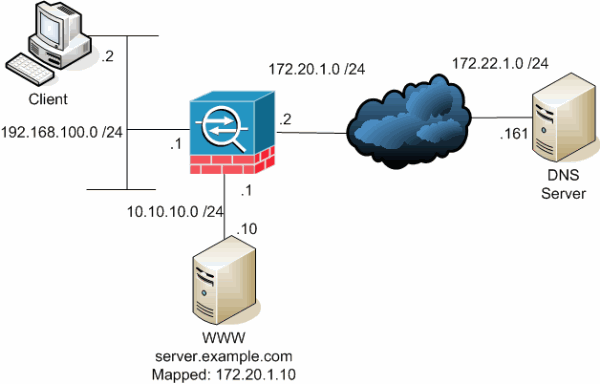 The DNS server replies with the mapped address of the WWW server. The ASA undoes the translation of the destination address of the DNS response and forwards the packet to the client. Note that without DNS doctoring enabled, the Addr in the answer is still the mapped address of the WWW server. DNS doctoring with the dns keyword gives the security appliance the ability to intercept and rewrite the contents of the DNS server replies to the client. When properly configured, the security appliance can alter the A-record in order to allow the client in such a scenario as discussed in the " Problem: Client Cannot Access WWW Server" section to connect. In this situation with DNS doctoring enabled, the security appliance rewrites the A-record to direct the client to 10.10.10.10 instead of 172.20.1.10. DNS doctoring is enabled when you add the dns keyword to a static NAT statement (Version 8.2 and earlier) or object/auto NAT statement (Version 8.3 and later) . This is the final configuration of the ASA to perform DNS doctoring with the dns keyword and three NAT interfaces for versions 8.2 and earlier. Choose Configuration > NAT Rules and choose the Object/Auto rule to be modified. Click Edit. Check the Translate DNS replies for rule check box. Click OK in order to leave the NAT Options window. Click OK in order to leave the Edit Object/Auto NAT Rule window. Click Apply in order to send your configuration to the security appliance. The ASA undoes the translation of the destination address of the DNS response and forwards the packet to the client. Note that with DNS doctoring enabled, the Addr in the answer is rewritten to be the real address of the WWW server. At this point, the client tries to access the WWW server at 10.10.10.10. The connection succeeds. This is the final configuration of the ASA to perform DNS doctoring with the dns keyword and three NAT interfaces. !--- clients access to the Internet. !--- to the WWW server via its outside address. Fill in the configuration for the new static translation. In the Name field, enter obj-10.10.10.10. In the IP Address field, enter the address of the WWW server IP address. From the Type drop-down list, choose Static. In the Translated Addr field, enter the address and interface that you want to map the WWW server to. In the Source Interface drop-down list, choose dmz. In the Destination Interface drop-down list, choose inside. In this case, the inside interface is chosen to allow hosts on the inside interface to access the WWW server via the mapped address 172.20.1.10. 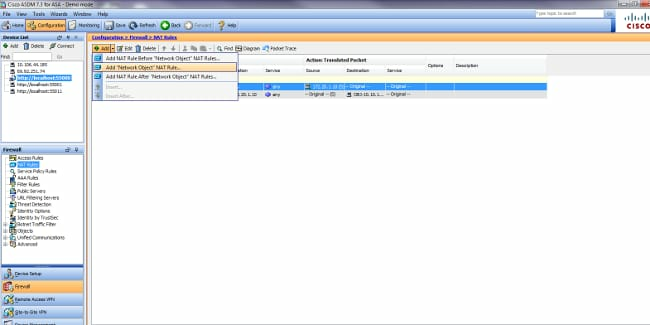 Click OK in order to leave the Add Object/Auto NAT Rule window. Click Apply in order to send the configuration to the security appliance. 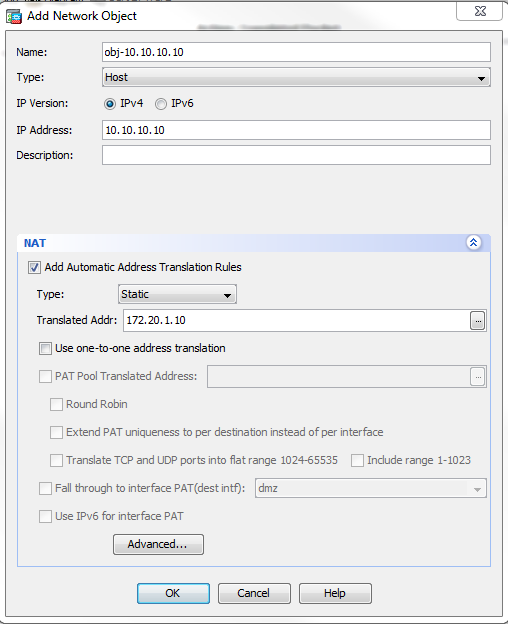 Fill in the configuration for the Manual/Twice Nat translation. In the Source Interface drop-down list, choose inside. In the Destination Interface drop-down list, choose dmz. In the Source Address field, enter the inside network object (obj-192.168.100.0). In the Destination Address field, enter the translated DMZ server IP object (172.20.1.10). In the Source NAT Type drop-down list, choose Dynamic PAT (Hide). In the Source Address [Action: Translated Packet section] field, enter dmz. In the Destination Address [Action: Translated Packet section] field, enter the DMZ server real IP object (obj-10.10.10.10). Click OK in order to leave the Add Manual/Twice NAT Rule window. The client attempts to contact the WWW server at 172.20.1.10. The security appliance sees the request and recognizes that the WWW server is 10.10.10.10. The security appliance creates a TCP connection between the client and the WWW server. Note the mapped addresses of each host in parentheses. The show xlate command on the security appliance verifies that the client traffic translates through the security appliance. In this case, the first static translation is in use. The show conn command on the security appliance verifies that the connection has succeeded between the client and the WWW server through the security appliance. Note the real address of the WWW server in parentheses. This is the final configuration of the ASA to perform DNS doctoring with destination NAT and three NAT interfaces. Complete these steps in order to enable DNS inspection (if it has been previously disabled). In this example, DNS inspection is added to the default global inspection policy, which is applied globally by a service-policy command as though the ASA began with a default configuration. Create an inspection policy map for DNS. From the policy-map configuration mode, enter parameter configuration mode in order to specify parameters for the inspection engine. 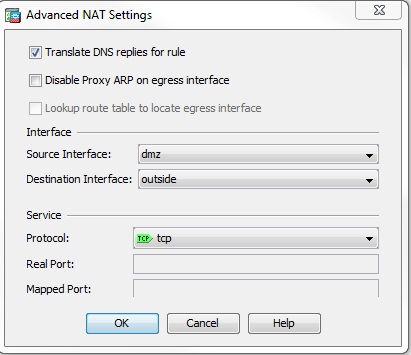 In policy-map parameter configuration mode, specify the maximum message length for DNS messages to be 512. Exit out of policy-map parameter configuration mode and policy-map configuration mode. Confirm that the inspection policy-map was created as desired. Enter policy-map configuration mode for the global_policy. In policy-map configuration mode, specify the default layer 3/4 class map, inspection_default. In policy-map class configuration mode, use the inspection policy map created in steps 1-3 in order to specify that DNS should be inspected. Exit out of policy-map class configuration mode and policy-map configuration mode. Verify that the global_policy policy-map is configured as desired. !--- The configured DNS inspection policy map. !--- DNS application inspection enabled. Verify that the global_policy is applied globally by a service-policy. Create an access list for each capture instance you want to create.The ACL should specify the traffic that you want to capture. In this example, two ACLs have been created. !--- All traffic between the DNS server and the ASA. !--- All traffic between the ASA and the DNS server. !--- All traffic between the client and the DNS server. !--- All traffic between the DNS server and the client. 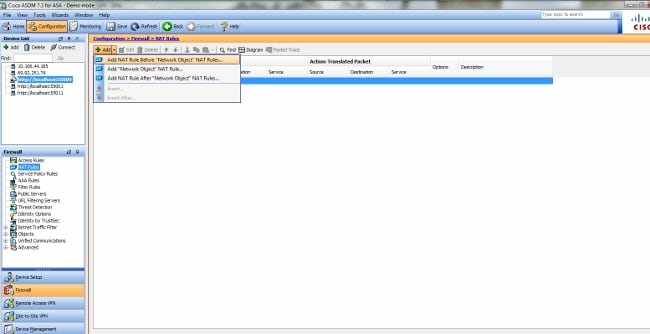 (Optional) Copy the capture(s) to a TFTP server in PCAP format for analysis in another application. Applications that can parse the PCAP format can show additional details such as the name and IP address in DNS A records. Make sure that you have DNS inspection configured on the security appliance. If a connection cannot be created between the client and the WWW server, it might be due to a NAT misconfiguration. Check the security appliance logs for messages which indicate that a protocol failed to create a translation through the security appliance. If such messages appear, verify that NAT has been configured for the desired traffic and that no addresses are incorrect. Clear the xlate entries, and then remove and reapply the NAT statements in order to resolve this error.